Completed Solar and Wind Farms — Goodfellow Bros.
To reach the isolated area of the island, the team constructed 15,000 lf of access road. 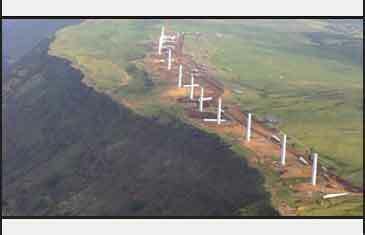 Once complete, the team performed foundation excavation for fourteen wind turbines along the top of an 800-ft cliff defining the southern volcanic rift zone of Mauna Loa. Construct seventeen miles of new road. The team moved over 110,000 cy of excavation and placed 350,000 tons of roadway aggregates, seventy-eight turbine sites while providing road maintenance and erosion control. Ten miles of new roads and crane paths, performed over 250,000 cy of excavation for turbine sites and excavated and backfilled forty-seven turbine spread foundations. 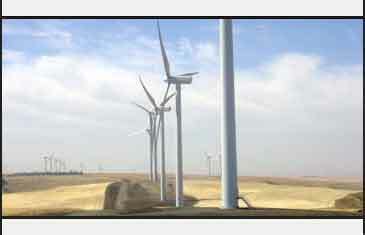 The wind turbine farm included the intermittent placement of fourteen turbines between phases I and II. The team rebuilt 2 miles of off-site road, widened existing roads to accommodate the crane footprint, constructed 5 miles of new haul road and performed road maintenance and erosion control. The wind farm consisted of thirty-nine turbines. The team built ten miles of haul road, improved 5 miles of existing roads, built laydown roads, built laydown yards and storage areas and constructed crane and turbine pads. GBI moved over 60,000 cy of excavation, placed 122,000 tons of roadway aggregates and performed road maintenance and erosion control.